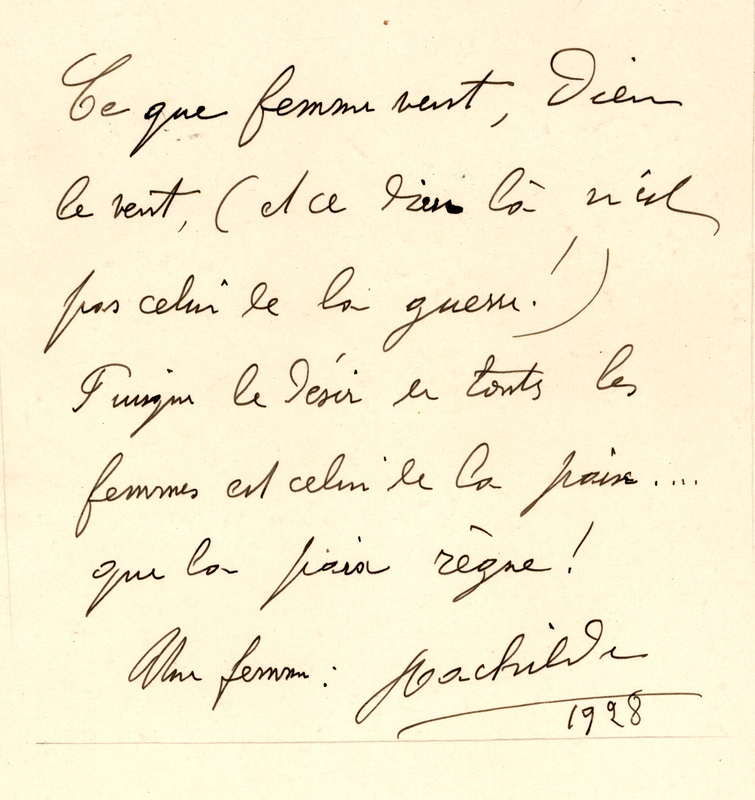 The original Autograph Statement Signed “Rachilde”, about Peace, for inclusion in the anthology Pax Mundi, Livre D’or De La Paix. In French (with separate translation) on card, folio, in fine condition. Dated 1928. “What woman wants, God wants (and that god is not the god of war! Since the desire of all women is for peace … let peace reign! A woman: Rachilde.” [translation] Rachilde was the nom de plume of Marguerite Vallette-Eymery (1860 – 1953), a French author. Dubbed “Mademoiselle Baudelaire” by Maurice Barres, she was called a pornographer by Jules Barbey d’Aurevilly. Rachilde and her husband, Alfred Vallette, were some of the most influential people in the symbolist and decadent community in Paris. 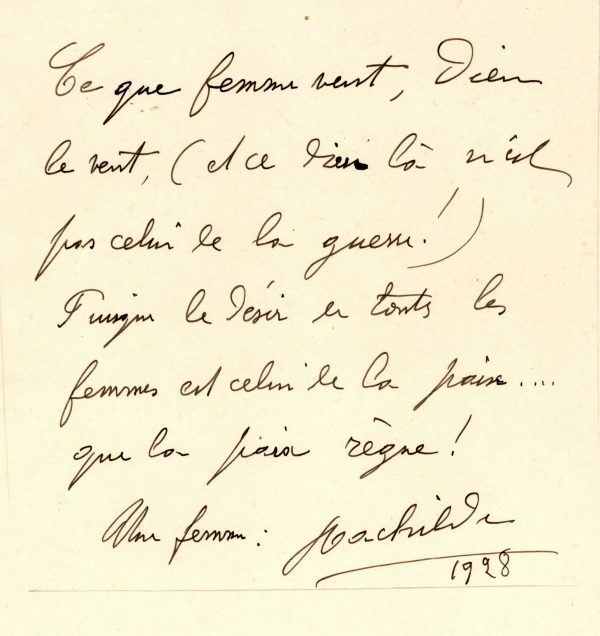 They started the Mercure de France and hosted salons every Tuesday afternoon where young artists could come and meet established writers, such as Oscar Wilde who was inspired in part by Rachilde’s book Monsieur Venus. This presentation statement was prepared for publication in the famous anthology Pax Mundi. Livre D’or De La Paix (Geneva, 1932), which contained numerous autograph facsimile statements about the prospects for World Peace. It was prepared by the World League for Peace with the approval of the League of Nations.